The Stables have been converted to provide accommodation for up to 6 people in 3 double or twin rooms each with en-suite bath or shower and TV/DVD player. Large open plan sitting, dining, kitchen with original beams and oak floor, 32in flat screen TV and Wifi. Situated between farmhouse and farmyard on working family farm overlooking fields (with cows in summer), trees and barns. High quality comfortable furnishings. Linen, towels and toiletries provided. The Stables are situated in a wonderful part of the Wiltshire countryside on the edge of the Pewsey Vale in an Area of Outstanding Natural Beauty. Ideal for walking and cycling across downland, through local woods and Savernake Forest or along the Kennet and Avon Canal which is less than a mile from the property. The area is full of wildlife including hares, deer and many bird species from lapwing, kites, barn owls, and kestrels. We are within walking distance of Crofton Beam Engines on the Kennet and Avon Canal and Wilton Windmill. We are close to the market towns of Marlborough, Hungerford and Devizes and less than an hour from the beautiful cities of Salisbury, Bath, Oxford and Winchester and the ancient sites of Stonehenge and Avebury are both less than half an hour from The Stables making it the perfect base from which to explore the area. Other great days out within a short distance are Bowood House (with it's super play ground for children, Capability Brown grounds and beautiful house); Lacock Abbey; Highclere Castle (the home of Downton Abbey); Longleat Safari Park and the Caen Hill Locks (at Devizes). Activities which can be arranged nearby include horse riding, bike hire (bikes can be delivered to The Stables) clay pigeon shooting and fly fishing. There are some great places to eat out locally. The nearest pub is The Swan at Wilton (1 mile) which is family friendly and serves good food. Other good pubs which we recommend are The Three Tuns at Great Bedwyn, The George at Vernahm Dean and The Shears at Collingbourne Ducis. For a treat there's The Harrow at Little Bedwyn and The Woodspeen - both with Michelin Stars and now we have Rick Stein who has just opened his new restaurant in Marlborough. Marlborough and Hungerford both have a good choice of cafes and restaurants including the famous Polly Tearooms. There's a good range of shops nearby - Marr Green Farm shop (1 mile), Cobbs Farm Shop (7 miles) which also now has an indoor play barn for children and has Pick you Own in the summer. Most supermarkets deliver to The Stables so you can pre order a delivery before you get here. We now have a second cottage available to book from May 2017! The Hen House sleeps 4 in two 2 en suite rooms please get in touch for more details and great offers! Book The Stables and The Hen House together and we can accommodate 10 people in 5 bedrooms all with their own en suite bathroom. Discount applies when both properties booked together - please ask for details. 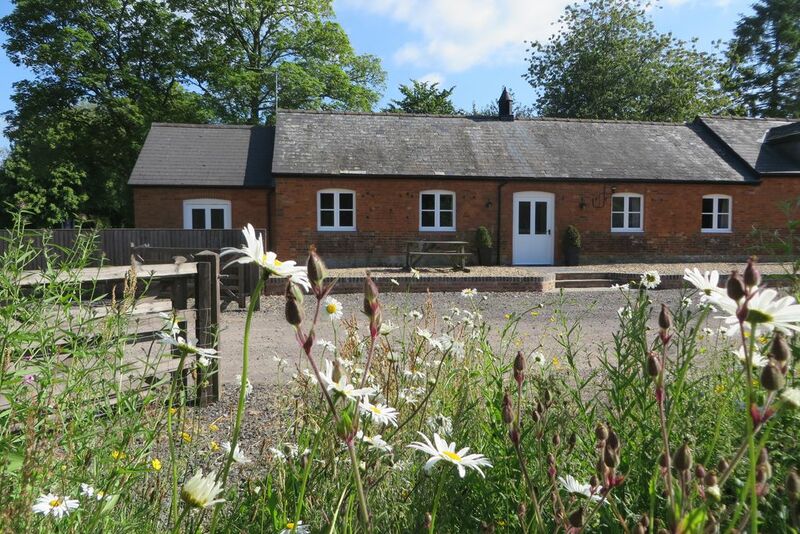 The Stables has been carefully converted from a beautiful Victorian red brick stable block to provide really comfortable, en suite, light and warm accommodation on our family working farm in this beautiful part of Wiltshire . So many guests comment on how much there is to do in the area and how accessible everything is from here with great links to London and other cities (Bath, Oxford etc) . The Stables is the perfect base for visiting so many places nearby and provides the perfect spot to relax after a day out. The village itself is very pretty with thatched cottages surrounding the village green with great walks and beautiful views. There are lots of excellent pubs and restaurants nearby to choose from and we are happy to help with information and recommendations. Large open plan living/dining/kitchen with oak floor and original oak beams and vaulted ceiling. 32 inch flat screen TV, Wifi, ipod speakers/dock. Double oven with grill, ceramic hob, fridge/freezer, dishwasher, washing machine and drying facilities. Television and DVD in living room and in each bedroom. Small garden area next to property. Large Village Green and playing field near by suitable for games and relaxing. Bicycles welcome and storage provided. Also bicycle hire service in Marlborough will deliver to The Stables. Garden furniture provided in sunny spot for outdoor dining. Temporary membership of nearby tennis club can be arranged before you arrive. There are 3 golf courses within 10 miles - Marlborough, Ogbourne and Tidworth. The Stables are all on one level apart from one step down in to the double bedroom. There are two steps up from the parking area but we can provide a ramp. Doors are wide enough to accommodate a wheelchair. Please ask if you need more information. Outside: Outside there is a gravel terrace with garden furniture and an area of lawn, these overlook barns, fields and trees. Utility Room: Oil fired central heating. Cleaning / Towels / Linen / Maid service: All bed linen and towels provided and included in price. A well located, peaceful, spacious place. The Stables are lovely. Well laid out, modern and comfortable. The immediate area is peaceful and relaxing. We found that the location was very central to all the things we planned on doing - walking, visiting sites of ancient history ( Avebury, West Kennet, Stonehenge) The walking is great, lots of public footpaths in Wiltshire and the Avon Kennet canal, Savernake forest, The Ridgeway. Great little villages and pubs. Just returned from a lovely three night stay at The Stables, Manor Farm, East Grafton - with my elderly parents, sister and two dogs. The accommodation is so comfortable, a lovely bathroom each, a TV each, well equipped, warm, clean and in beautiful countryside. Fantastic pub at Wilton called The Sun. The owners are lovely and welcoming - as are the chickens and guinea fowl! Lots of information to help you over your stay. We will be back and thoroughly recommend this property. Thank you so much for a wonderful opportunity for friends from Somerset, Northamptonshire and Hertfordshire to catch up in a wonderful, relaxing and lovely environment. The accommodation was well thought out and we had a lovely girly weekend chilling out and exploring the local area. We will definitely be getting our diaries together to plan a return trip soon. From our initial enquiry to our departure our visit was dealt with excellently. On arrival the cottage was presented very well. Everything was in place from welcome supply of tea/coffee biscuits to good supply of all those essentials such as dish washer tablets, loo rolls etc. The conversion of the stables has been done to a very high standard with 3 double en-suite bedrooms an excellent open plan living space. The layout of space is ideal for families as one bedroom at one end of the conversion whilst the other two are at the other end seperated by the living space. The area around the cottage is ideal walking country and as the cottage is dog friendly your pet will also enjoy the experience. Of course you are staying on a working farm so care must be taken with dogs and children alike. De cottage was super. Alles was aanwezig. Zeer schoon. De drie badkamers is een luxe als je met zes personen verblijft. We are just 5- 10 minutes from Bedwyn and Pewsey train stations. Direct trains from London (Paddington 1hr 15 mins). About 1 hour from Heathrow and 2 hours from Gatwick airports. Only 15 mins from M4 motorway. Marlborough 6 miles, Hungerford 7 miles, Pewsey 5 miles, Devizes 15 miles. Stonehenge 20 mins, Avebury 20 mins, Salisbury 30 mins, Bath, Oxford and Windsor under 1 hour. Ideal base to explore wonderful countryside, close to Kennet and Avon Canal, Savernake Forest, Wilton Windmill, Crofton Beam Engines, Marlborough, Avebury, Stonehenge and The Ridgeway. Bath, Salisbury and Oxford all less than one hour away and days out in London on the train are easy from local station. Great base for walking or cycling breaks. Days out within easy reach include Longleat, Lacock, Legoland, Bowood House, Cotswold Wildlife Park, Highclere Castle, Poultons Park. Booking Deposit of £200 per week (£150 per short stay) required at booking balance due 6 weeks before arrival. Short breaks available. Payment by cheque, card or bank transfer. Please ask if you are not sure happy to help! We now have another cottage as well which sleeps 4 if you need more space. Discounts available for mid week bookings and low occupancy or longer bookings. Changeover Day: Short breaks normally Friday to Monday and Monday to Friday. We try to be as flexible as possible so please ask for dates you require. Notes on prices: We now have a live Facebook page! Like to stay updated on offers and availability: https://www.facebook.com/TheStablesBreaks/ Last minute bookings welcome.